When residents or patients in a care home or hospital require assistance they need a reliable nurse call system they can depend on for help. As an independent company with over 25 years of experience and knowledge in this field, we will always recommend the best, and most cost effective solution for your budget. 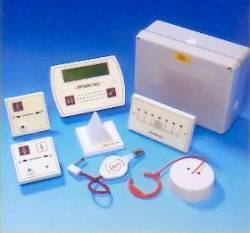 Wireless Nurse Call systems or Radio Nurse Call, see our Wireless Nurse Call page for these. It is now not necessary to have a mass of ugly wiring around the building, as all our systems operate on just a pair of wires within a thin telephone type cable. 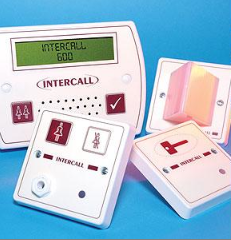 These are particularly useful should you require the facility of speech communication to the rooms, this is possible with the Intercall 700 Nurse call system on a hard wired system, but not on a Radio system. Jack socket accepts wide range of devices including ext. leads, pressure mats etc. Displays work identically but can be configured on-site to operate in areas. 3 levels of call, Standard, Assistance and Emergency. Combined speech call point with built-in display. Staff are able to see & deal with other calls on the system. Do you require Call Logging? For Intercall 600 Nurse Call systems we can now provide a cost effective way to log and record all calls made on the system. The IP470 can be fitted onto an existing Intercall 600 or 700 system and will then provide data logging and real time event calls by connecting it to a single Laptop, PC or a local IP Network. Easy to use Web based call logging. Provides search with ,date, time, location, event type. 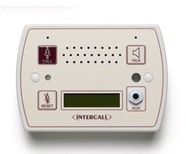 Connects to existing Intercall Nurse Call system. Provides an IP interface for other equipment. If you are planning to extend a Nurse Call system, or are starting a new project, please complete the "Request a Quotation" form on the home page.